You can move a PDB to a different CDB or application container. 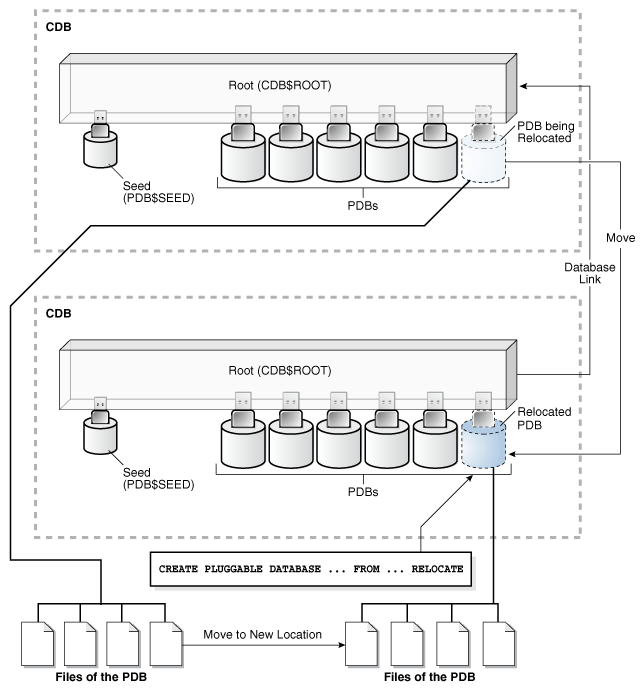 During relocation, the source PDB can be open in read/write mode and fully functional. This technique is the fastest way to move a PDB with minimal or no down time. Otherwise, unplugging the source PDB requires a PDB outage until the PDB is plugged in to the target CDB. The operation moves the files associated with the PDB to a new location, adds the PDB to the target CDB, and then opens the PDB. You can relocate PDBs on the command line using SQL, the DBCA utility, or the Rapid Home Provisioning utility. The CREATE PLUGGABLE DATABASE ... RELOCATE statement moves a PDB to a different container. The examples in this section demonstration relocation using SQL and DBCA. The following graphic shows the relocation of a common PDB (that is, not an application PDB) to a new CDB. The source PDB is plugged in to the CDB root, and the target PDB is plugged in to the CDB root. Note that the CREATE PLUGGABLE DATABASE ... RELOCATE statement copies the data blocks, undo blocks, and redo blocks to the new location. A database link is required. Description of "Figure 8-1 Relocate a PDB into the Root Container"
You can relocate a PDB into an application container as an application PDB. The target PDB can be in the same CDB or a different CDB. You can relocate an application PDB from one application root to another. The target PDB can be in the same CDB or a different CDB. You can relocate an empty application root from one CDB to another, but the application root must not have any hosted application PDBs. The following graphic illustrates how this technique creates a new application PDB in an application container. Description of "Figure 8-2 Relocate a PDB into an Application Container"
When you open the relocated PDB for the first time, Oracle Database drains active sessions on the source PDB and redirects client connections to the relocated PDB services. Opening the relocated PDB initiates the shutdown of the original source PDB. The source and relocated PDBs are never open at the same time. When moving a PDB between data centers, or from an on-premise environment to a cloud environment, all the data must physically move. For large PDBs, this process may take considerable time, possibly violating availability components of an SLA. PDB relocation eliminates the outage completely. You can relocate the PDB without taking the application offline, changing the application, or changing network connection strings. PDB relocation executes an online block level copy of the source PDB data files, redo, and undo while the source PDB is open with active sessions. When the target PDB comes online because of an ALTER PLUGGABLE DATABASE OPEN statement, Oracle Database terminates the active sessions and closes the source PDB. Oracle Database 18c introduces database-generic session draining, where active sessions can exit gracefully under a timer. After the timer has expired, Oracle Database terminates all active sessions and reconnects them to the relocated PDB. This feature is enabled by default for all maintenance operations invoked at the database service and PDB levels: stop service, relocate service, relocate PDB, and stop PDB. PDB relocation services are available in Oracle RAC and single-instance environments in which a PDB relocates between CDB instances in the same clustered database or between distinct CDBs. In Oracle Clusterware, the Rapid Home Provisioning feature automates PDB relocation. An example of finer-grained relocation in an Oracle RAC environment is service relocation between PDB instances. Oracle RAC and Oracle Clusterware offer a rich high availability environment that further minimizes the effect on connected clients during relocation. For example, shared storage may minimize or remove the necessity to copy data files. In an Oracle Clusterware environment, when relocating a PDB between different CDBs, you must create the non-default service resource using SRVCTL. A key requirement of planned maintenance is draining or failing over PDB sessions so that application work is not interrupted. The details of PDB relocation vary depending on the listener networks. A typical use case is application servers and pooled applications that test connections when borrowing from connection pools, returning connections to the pool, and at batch commits. When draining sessions, the database automatically intercepts the connection test, closes the connection, and then returns a failed status for the test. After receiving the failed status, the application layer can request a different connection. In this way, the application is not disrupted. For an optimal configuration that minimizes the effect on the client, consider using Oracle RAC with FAN and Application Continuity. When the source and target location share a common listener network, forwarding client connections is not necessary because the SQL*Net layer forwards client connections implicitly. When independent listeners do not use cross-registration, the listener in the target CDB and source CDB have no knowledge of each other or of their respective published services. If you use the same listener for the PDB in its old and new locations, then new connections are automatically routed to the new location when relocation completes. This situation is typical of a relocation between CDBs in the same host. In this case, the PDB is re-registered with the listener in its new location. Additional connection handling is not required. If the PDBs use different listeners, and if you employ cross-registration of their respective listeners through configuration of the local_listener and remote_listener parameters, then relocation is seamless. The availability and location of the PDB’s services are automatically registered with both listeners. This situation is typical of relocation between hosts within a data center, perhaps for load balancing purposes. In shared and cross registered listener environments, services from all databases are published to the common listener network. For this reason, services for relocated PDBs are immediately known to the common listener network. To avoid service name space collisions, PDB service definitions must be unique in the common listener network. The user issues CREATE PLUGGABLE DATABASE ... RELOCATE AVAILABILITY NORMAL. This step executes a hot clone of the source PDB from its original location to its target location. The source PDB copies data files, undo blocks, and redo blocks to the target PDB as of an implicit begin SCN marker. When this step completes, two transactionally consistent copies of this PDB exist: one in the source container and one in the target container. For the duration of the operation, processing continues uninterrupted on the source PDB. 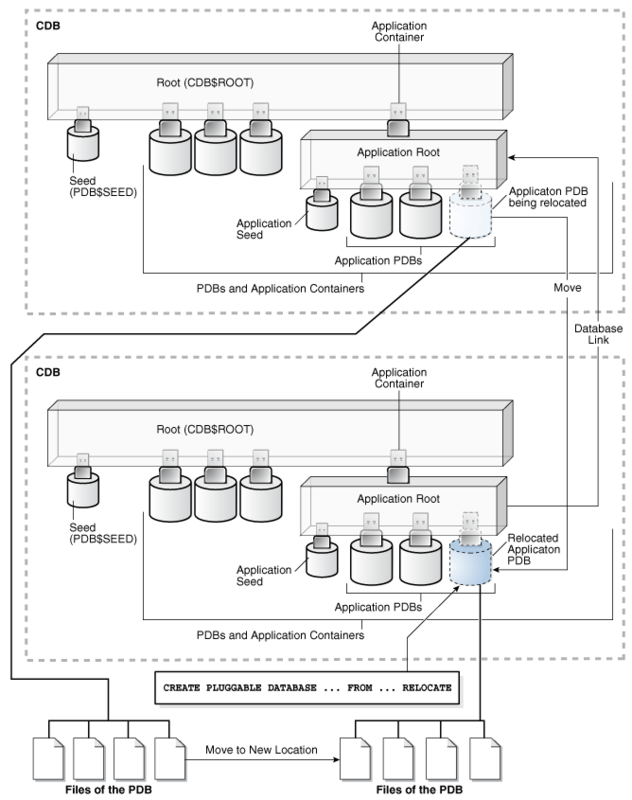 Users of an application or applications connected to the source PDB are unaware that a relocation is underway. All existing application connections, and new connections created during this step, continue to connect to the source PDB. The user issues ALTER PLUGGABLE DATABASE OPEN. The target PDB implicitly sets the end SCN marker, and applies any redo or undo required to complete media recovery to satisfy the implicit end SCN marker. When media recovery occurs on the target PDB, Oracle Database initiates active session draining on the source PDB. PDB services are registered with the listener and are available on the target CDB. The source PDB is closed. The target PDB opens in read/write mode. This step completes the relocation of the PDB to the target CDB. At the end of the operation, connections point to the newly relocated PDB. After the PDB is opened in read/write mode, its status is NORMAL. The database returns an error if you attempt to open the PDB in read-only mode. The AVAILABILITY MAX clause in CREATE PLUGGABLE DATABASE ... RELOCATE implicitly instructs the SQL*Net layer to reconfigure the original listener. This situation may be common when relocating a PDB between data centers. This configuration is intended to be temporary while the Oracle Internet Directory (OID) or LDAP server is updated or the client connections are modified. Do not set the ALLOW_MULTIPLE_REDIRECTS_listener_name parameter for node listeners because it may allow infinite redirection loops in certain network configurations. The user issues CREATE PLUGGABLE DATABASE ... RELOCATE AVAILABILITY MAX. The LISTENER_NETWORKS initialization parameter is implicitly updated in the source PDB with the forwarding address, and the listener PDB services for the source CDB are updated with the forwarding address. The target PDB opens in read-only mode while media recovery completes. At this stage, only queries of the target PDB are permitted. Queries behave exactly as if they had been run on the source PDB. However, connections attempting DML do not complete. Read-only connections are immediately forwarded to the new hosting listener, and new read/write connections are forwarded to the new hosting listener, where they spin until the target PDB is opened in a consistent state. The source PDB executes a SHUTDOWN IMMEDIATE, terminating persistent connections. An artifact known as a tombstone PDB remains in the source CDB to protect the PDB’s namespace and preserve the listener forwarding configuration until the updates are complete. In the root of the source CDB, the tombstone PDB is visible in V$CONTAINERS with a status of RELOCATED. When you change the application connect strings to provide direct connections to the target PDB, you can drop the tombstone PDB from the source CDB. The FROM clause identifies the location of the source PDB. For src_pdb_name, specify the name of the source PDB. For link2src, specify a database link that indicates the location of the source PDB. The database link must have been created in the target CDB, which is the CDB to which the PDB will be relocated. The link can connect either to the root of the remote CDB or to the remote PDB. The AVAILABILITY clause determines how the database handles client connections. You can relocate a PDB by running DBCA in silent mode. The relocatePDB command performs the relocation. The name of the PDB that you intend to relocate. The net service connection to the remote CDB. The name of the SYS user in the local CDB. The password of the SYS user in the local CDB. The name of the SYS user in the remote CDB. The password of the SYS user in the remote CDB. The name of the common user in the remote CDB. The password of the common user in the remote CDB. The name of the source PDB. The name of the PDB after relocation. In Oracle Grid Infrastructure, you can use Rapid Home Provisioning to automate relocation of a PDB from one CDB to another. The target CDB is the CDB to which the PDB is being relocated. The target PDB is the relocated PDB. After the CREATE PLUGGABLE DATABASE ... RELOCATE operation completes, Oracle Database moves the PDB from the source CDB and then adds it to the target CDB. Address the questions that apply to relocating a PDB in "Table 5-3". The table describes which CREATE PLUGGABLE DATABASE clauses you must specify based on different factors. Also, complete the prerequisites described in "General Prerequisites for PDB Creation". The source CDB must be in local undo mode. This step ensures that the PDB relocation operation automatically starts the PDB services in the target CDB. In the target CDB, the current user must have the CREATE PLUGGABLE DATABASE system privilege in the CDB root. If the target CDB is not in ARCHIVELOG mode, then the PDB must be in open read-only mode during the operation. This requirement does not apply if the target CDB is in ARCHIVELOG mode. A database link must enable a connection from the target CDB to the source CDB. The database link must connect to the root of the source CDB. If the PDB is an application PDB, then the database link must connect to its application root. The user that the database link connects with in current CDB of the PDB must have either the CREATE PLUGGABLE DATABASE system privilege or the SYSOPER administrative privilege. If the database link connects to the CDB root in the PDB’s current CDB, then the user that the database link connects with must be a common user. They must have the same endianness. The database options installed on the source platform must be the same as, or a subset of, the database options installed on the target platform. If the character set of the CDB to which the PDB is being relocated is not AL32UTF8, then the PDB’s current CDB and the CDB to which it is being relocated must have compatible character sets and national character sets. If the character set of the CDB to which the PDB is being relocated is AL32UTF8, then this requirement does not apply. If you are creating an application PDB, then the source PDB and target application container must have the same application name and version. In SQL*Plus, log in to the target CDB as a user with the CREATE PLUGGABLE DATABASE system privilege. Ensure that the current container is the root of the target CDB or target application container. Run the CREATE PLUGGABLE DATABASE ... RELOCATE statement with the FROM clause. Specify the source PDB in the FROM clause, and include the RELOCATE clause. To redirect connections from the old location of the PDB to the new location, specify the AVAILABILITY MAX clause. Specify other clauses when they are required. After you relocate the PDB, it is in mounted mode, and its status is RELOCATING. You can view the open mode of a PDB by querying the OPEN_MODE column in the V$PDBS view. You can view the status of a PDB by querying the STATUS column of the CDB_PDBS or DBA_PDBS view. A new default service is created for the PDB. The service has the same name as the PDB and can be used to access the PDB. Oracle Net Services must be configured properly for clients to access this service. Optionally, to determine the status of the file copy operation, query V$SESSION_LONGOPS. The OPNAMES column shows kpdbfCopyTaskCbk for the data file copy and kcrfremnoc for the redo file copy. Open the new PDB in read/write mode. This step is required to complete the integration of the new PDB into the CDB. After the PDB is opened in read/write mode, its status is NORMAL. An error is returned if you attempt to open the PDB in read-only mode. A PDB cannot be recovered unless it is backed up. If an error is returned during PDB relocation, then the PDB being created might be in an UNUSABLE state. You can check the PDB state by querying the CDB_PDBS or DBA_PDBS view, and you can learn more about PDB creation errors by checking the alert log. An unusable PDB can only be dropped, and it must be dropped before a PDB with the same name as the unusable PDB can be created. "About the CDB Undo Mode"
"Modifying the Open Mode of One or More PDBs"
This example relocates a PDB named pdb1 from a remote CDB to the current CDB. This example uses DBCA to relocate a PDB named pdb1 from a remote CDB to the local CDB, where it will be renamed relpdb1. When the current container is the CDB root, the new PDB is created in the CDB root. When the current container is an application root in an application container, the new PDB is created as an application PDB in the application root. The current user has the CREATE PLUGGABLE DATABASE system privilege in the root of the target CDB. The common user c##myadmin has SYSOPER administrative privilege and CREATE PLUGGABLE DATABASE system privilege in the source CDB. The PATH_PREFIX clause is not required. The FILE_NAME_CONVERT clause and the CREATE_FILE_DEST clause are not required. Either Oracle Managed Files is enabled, or the PDB_FILE_NAME_CONVERT initialization parameter is set. The files will be moved to a new location based on the Oracle Managed Files configuration or the initialization parameter setting. Storage limits are not required for the PDB. Therefore, the STORAGE clause is not required. There is no file with the same name as the new temp file that will be created in the target location. Therefore, the TEMPFILE REUSE clause is not required. Connections should be relocated automatically from the source PDB to the relocated PDB. Therefore, the AVAILABILITY MAX clause is included. The user in the local database has the CREATE PLUGGABLE DATABASE privilege in the root container. The remote CDB is in local undo mode. The remote and local CDBs are in ARCHIVELOG mode. The common user in the remote CDB to whom the database link connects has the CREATE PLUGGABLE DATABASE, SESSION, and SYSOPER privilege. The local and remote CDBs have the same options installed. You are running DBCA on the host of the CDB that will contain the relocated PDB. The local CDB is named loccdb1. The remote (source) CDB is named remcdb1 and resides on host remcdb1host. The instance name for the remote CDB is reminst. The remote PDB, which is the PDB to be relocated, is named rempdb1. The common user c##adminuser_remcdb1 resides in remcdb1. The administrative user locSYS has SYSDBA privileges on loccdb1, which is the CDB to which the PDB is being relocated. The administrative user remSYS has SYSDBA privileges on remcdb1, which is the CDB that contains the PDB to be relocated. After relocation to loccdb1, the PDB will be renamed relpdb1.